Ivory James sired $487,700 Sam Houston Futurity qualifier Captain Ice during Friday's first of two-nights of trails for the Grade 2 race. HOUSTON, TX�APRIL 7, 2017�A $7,200 Heritage Place Winter Mixed short-yearling repurchase, Capital Ice won a three-way-shake from Krash N Diamonds and Daddys Blushing to secure the final spot on the first night trials to the Sam Houston Futurity. The 10 fastest qualifiers, five from each night of trials, will return to the Houston racetrack on Saturday, April 29th to vie for the winner's share of a $487,700 over 330 yards. Ridden by Jose Martinez, the IVORY JAMES colt finished second in the fourth of nine trials while recording a :16.984 clocking to get the fifth fastest time. Angel Sanchez trains the gelding for owner Jody Garcia. 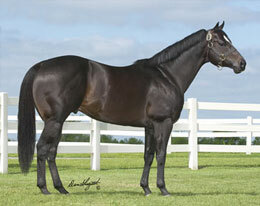 Womack/Cavender Farms bred Capital Ice in Texas from the Mr Eye Opener mare a Fantastic Six. He is a half-brother to Remington Park Juvenile runner-up Days Gone Down. For a complete list of Friday night's qualifiers, times, sires, dams, owners, breeders, trainers and jockeys CLICK HERE. The second night of trials, another nine races, will be contested at Sam Houston Race Park on Friday. First post is 6:10 PM (CDT).